The little details mean a lot to me when it comes to parties. 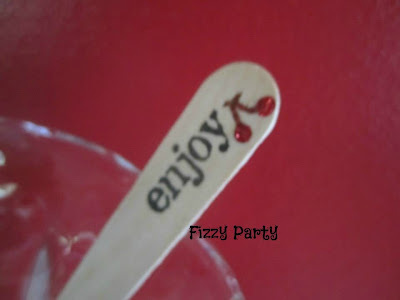 When I was planning my Cherry Love mini party one of the little details that came to mind was ice cream spoons. Katarina's Paperie had just what I needed. Not only does she carry ice cream spoons but they have cute sayings too: Make a wish, enjoy and mustaches. I went with Enjoy because that's what you do when you eat ice cream. I added my own little detail that gave the spoons big impact. Glittered cherries. Little Detail, Big Impact for an ice cream party. Katarina's Paperie has lots of little details for your next party. Twin, bags, cupcake liners, and on and on. Be sure to check out her shop for all the little details you need. Thanks so much for featuring our shop on your blog today! I love how you embellished the spoons. It was such a fantastic idea. I'm definitely going to have to try it at an upcoming party. Thanks again! You're very welcome! I think the embellishment adds a sweet little touch. I'll be sure to watch your posts for your embellishment. The spoons are so cute and such a fun callback to those little wooden spoons that come with the vanilla/orange sherbet cups from childhood. Yes! Exactly. I loved those little vanilla/orange sherbet cups.